Mortal Kombat arrives in a new generation with a refinement on the excellent fighting mechanics we loved four years prior along with slick-looking visuals, but an over-reliance on microtransactions is disconcerting. Even now, when you play the song “Techno Syndrome” by the Immortals, it’s really easy to get pumped up about playing the latest game in this bloody, technical series as soon as the song starts listing off the characters. “Kano.” The mercenary from the Black Dragon, with the enhanced robotic eye. “Liu Kang.” Earthrealm’s savior, winner of two consecutive tournaments. “Raiden.” God of Thunder, protector of Earthrealm, and unparalleled warrior deity. “Johnny Cage.” Hotshot movie star with a matching attitude, but one of the best fighters on the planet. “Scorpion.” Undead warrior fighting for the NetherRealm, whose rage literally burns. “SubZero.” Icy warrior for the Lin Kuei clan, and fierce rival of Scorpion. “Sonya.” Deadly Special Forces officer, and relentless pursuer of Kano. All of these characters, and a whole lot more, appear in NetherRealm Studios’ latest entry in the popular franchise, Mortal Kombat X. The first installment of the game to appear on eighth generation video game hardware, Mortal Kombat X is oddly beautiful: the renderings and animation are all spectacularly smooth and impressive, but the game also takes a trademark aspect — the gore — to the next level as well. Because it features such stark imagery of decapitation and dismemberment, some might feel that it’s remiss to call such things “beautiful,” but still: if you’re going to watch someone’s head get ripped off before being thrown on a rock and impaled by a sword, this is one of the clearest, most beautiful ways to see such a stomach-churning image unfold. Most major fans of the franchise know, however, that Mortal Kombat was never about the gore. The gore is just what got people in the door when the first game was causing outrage in arcades across the country and in Senate hearings on Capitol Hill in the early 90′s. What keeps you playing are the fighting mechanics, the nuance, the desire to pull off combinations correctly, and the sheer thrill of taking on an opponent to see who the better player is. Mortal Kombat X brings back all of these great elements, adding new faces, new moves, and new levels of fun to the mix, but it’s not without some structural faults that are, in a word, troubling. The story mode for Mortal Kombat X mostly takes place 25 years after the events of the last game, introducing a new generation of fighters descended from old favorites. The first thing that will be apparent to anyone who boots up the game for the first time is just how gorgeous the game looks. While Mortal Kombat on last-gen systems had a finely crafted polish to the graphical presentation, the overall look of MKX takes things a step further, by using impressive particle effects and a far more vibrant and realistic lighting scenario. Liquid effects are also leaps and bounds better than the last game, with blood pouring realistically — if excessively — from the wounds of fighters, and molten effects are also vibrantly viscous in both the environments and on the fighters themselves. The overall aesthetic design of both the stages and the fighters themselves seem to be informed by a more “grounded” philosophy, which seems to be strange to try and apply to the larger-than-life world of Mortal Kombat. Recognizable fighters like Sub-Zero and Scorpion have received new costume designs that look a bit more practical than they have before, with Scorpion’s mask being separated into a hood and mouth guard, and Sub-Zero receiving a leaner silhouette. Other characters, like Sonya Blade, Cassie Cage, and Erron Black also seem to be outfitted with practical accouterments, while some others — like Reptile, D’Vorah, and Ferrah/Torr — retain a sensibility of flamboyant style over some kind of tactical substance. Everybody’s design is appropriate though, which is interesting considering the varying philosophies that go into who each character is, and what they can do. It’s really unsettling seeing Liu Kang as a revenant serving Quan Chi, and unfortunately, that doesn’t change by story’s end. The story in the game follows up on the events of 2011′s Mortal Kombat, which itself was a reboot of the franchise going over the events of the first three games in the series. Some things have changed, though. Both the major Shaolin monks of the series, Liu Kang and Kung Lao, didn’t survive the final events of the last game, with others like Sub-Zero and Jax joining they and the likes of Scorpion as a part of sorcerer Quan Chi’s revenant army. Early on in the story, though, some of these characters — including Sub-Zero, Scorpion, and Jax — are brought back to life due to a brutal beating of Quan Chi at the hands of Johnny Cage, while Raiden entraps the rogue elder god Shinnok in his amulet of power. The story then jumps into the future, 25 years later. Johnny Cage and Sonya Blade have had a daughter together, Cassie Cage, but they’re now divorced. Jax has a daughter named Jacqui Briggs, and Kung Lao’s nephew Kung Jin — the series’ first gay character — has joined a special strike force created by Johnny Cage to try and resolve a civil war on Outworld. Since the death of Shao Kahn at the end of the first game, it’s in a state of chaos, as Kahn’s daughter Mileena has tried to overthrow the new emperor, Kotal Kahn. All of this eventually leads to Quan Chi attempting to release Shinnok from his imprisonment, which must allow the new generation of Mortal Kombat fighters to try to put a stop to the evil god once and for all. Unlike the last game’s story, this one felt far more convoluted and difficult to follow. While it was very nice seeing the new characters introduced and being generally well-rounded, the story in MKX is not quite as memorable as its predecessor and tended to frustrate me with its use — and lack of use — of certain characters. Still, given that this is a fighting game, the presence of the story and the game’s dedication to it is very impressive, since it certainly takes dramatic and storytelling cues from the wonderful narrative told in 2013′s Injustice: Gods Among Us. 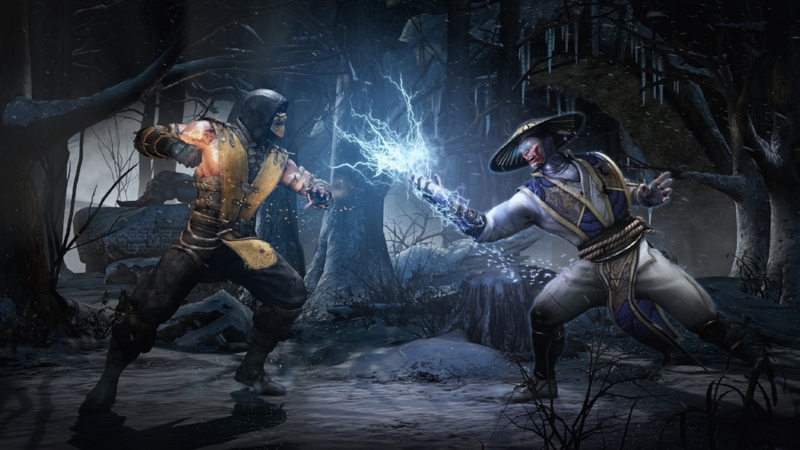 Still, though, Mortal Kombat X‘s story doesn’t quite match up to the fun and nostalgic trip we got in 2011′s game. Still, it could be said that this aspect of the game is far better than it has any right to be. As you work to unlock items in the “krypt,” be wary of fearsome creatures attacking you! Mortal Kombat X features a pretty diverse wealth of game modes, ranging from the classic tournament ladder to the “Test Your Luck” ladder, which gives you completely random modifiers as you take on either a computer or online opponent. Perhaps the most interesting element introduced in this game is the arrival of “factions.” When you boot the game up for the first time, you’ll be asked to join one of five factions, all of which are inspired by the games’ organizations in various preceding stories. You can join Sub Zero’s clan, the Lin Kuei, Raiden’s group of protectors, the White Lotus, Kano’s criminal empire, the Black Dragon, Quan Chi’s dark forces of the NetherRealm, the Brotherhood of Shadow, or the militaristic home of Sonya Blade, Johnny Cage, and his daughter, the Special Forces. No matter how you play the game, playing anything in Mortal Kombat X can assist in the worldwide faction war, and will earn you points toward increasing your level in your faction of choice. At the end of each week, a faction is declared the winner of the war, with members receiving things like “faction kills” (which are, basically, simpler fatalities), character skins, and “koins” you can use to unlock items in the game’s “krypt.” Like the last game, the krypt is a fully-rendered 3D environment that features the game’s primary unlockables, including costumes, concept art, button combinations for fatalities, and numerous other fun items. Still, even with all of this extra content, a game like this largely comes down to one thing: the fighting. The 2.5D fighting from the last game is back, and sharper than ever with new enhancements and fighter variations. The overall feel of the fighting mechanics in Mortal Kombat X feel pretty familiar for people transitioning from the 2011 game into this one, with button combinations, physics, cancels, and overall tempo feeling very similar. MKX takes things a bit further, though, by incorporating different fighting variations into each character. For instance: the game’s flagship character, Scorpion, has three different variations that a player can choose between. With his “ninjutsu” variation, you can use his trademark swords to extend the reach of certain strikes, catching your opponent off guard while forcing them to rethink their tactics against you. With the “inferno” variation, you can call a wraith from the NetherRealm to assist you in briefly incapacitating your opponent, as they come from underground in a hellish flash to grab, hold, or trip up your enemy. With the “hellfire” variation, you can use Scorpion’s power as a revenant with burning rage to engulf them in flames, and even call on a fiery aura that will do damage to your enemy if they make the mistake of getting too close. Every fighter in the game has at least three different variations, with a lot of different possibilities that can inform the way you chose to take an opponent down. X-ray attacks return, more detailed and stomach-churning than ever, but fatalities make perhaps their goriest return in the series yet. Once again, in true MK fashion, they bring with them some truly twisted lessons on human anatomy coming to punctuate the game’s signature finishing moves. Also making their return are “brutalities,” which haven’t been present in the game in their traditional form since Mortal Kombat Trilogy on the Nintendo 64 — unless you count the “heroic brutalities” in Mortal Kombat vs. DC Universe, which most fans don’t. While more similar to a traditional fatality in overall execution, brutalities here have a bit more of a punch when compared to their appearances on older consoles. Also, they’re easier to perform, which should prove to make them a bit more likable this time around. Overall, the added elements largely enrich the core fighting experience to one that is fundamentally deeper on a mechanical level. It’s not the most balanced fighter in existence, but that’s generally expected from a game so new. The ability to release patches after release will likely bring balance tweaks and performance enhancements, with one notable patch already having dropped. As a fighter, particularly one made in the United States, it’s hard to see it getting any better than Mortal Kombat X. Still, though, there’s something that’s holding it back, and it’s indicative of a particularly damaging trend that is beginning to damage gaming at-large. Two prominent items offered for microtransactions, available in both the Xbox Games Store and the PlayStation Network Store. There is one major element working against this release, though, and that’s the looming presence of mobile game-style microtransactions. You see, a few years ago, Mortal Kombat developer NetherRealm Studios started making mobile versions of console games that were “free-to-play.” While you could play the basic elements of these games for free, they often revolve around the concept of “microtransactions:” smaller, more incremental purchases that allow you to play the game longer after depleting your alotted “energy,” or allowing more perks to be purchased to make the game easier or more fun. While these are optional, acquiring some items within normal gameplay that could be granted instantly with a purchase is monotonous, and they’re designed in a way to entice players into spending anywhere from .25 cents up to any amount between $75-$100 in order to “fully enhance” your experience. While NetherRealm has developed a mobile, “free-to-play” version of MKX— just as they’ve developed other mobile counterpart games to Injustice and Batman: Arkham Origins – the microtransaction has now bled into their home console offering, and I can’t help but be immensely disappointed by this. For $1, you can buy five “easy fatalities” — a much easier button combination as opposed to the game’s traditional inputs — or for $20, you can instantly unlock all of the items in the krypt instead of earning “koins” and unlocking items yourself in normal gameplay. Some might say that since Mortal Kombat was conceived as a quarter-sucking arcade game, this is somehow a “natural” inclusion into the existing framework of Mortal Kombat X, but that doesn’t make a lot of sense. MKX is a game that retails for $60. There’s already a $30 season pass, an additional character for $5, and a couple of miscellaneous skins for a couple bucks each. When it comes to playing a game that is not “free-to-play,” microtransactions shouldn’t enter the equation. Unfortunately, NetherRealm’s success with that business model in the mobile market have led them to include a similar — though admittedly not as substantial — framework for their console release, and I can’t help but feel that it cheapens the intent of this game somewhat. Never has something as gruesome as Mortal Kombat‘s fatalities looked so good. In the end, though, Mortal Kombat X is a superb fighting game experience. The added mechanics and technical detail that have gone into the actual fighting element includes many welcome improvements. Graphically, the game is extremely impressive, with liquid and particle effects in particular standing out significantly. The presence of new and returning game modes and ladders makes for a solid fighter, and easily the best of this console generation so far. That being said, the presence of microtransactions and a somewhat disappointing narrative keep this game from hitting a home run. While based solely on the fighting and the enhancements made to that overall portion of the game, this entry would be superior to its 2011 predecessor. The inclusion of some other elements, though — like microtransactions as well as some mysteriously absent characters — make me reticent to recommend Mortal Kombat X more than the 2011 game. Still, this is a phenomenal fighter that at the very least matches the solid recommendation of the last game, and it’s simply the best that you can find on new video game hardware. As a fighting game, Mortal Kombat X is sharper, and perhaps even more addictive than its best predecessors, and the inclusion of new fighters like the Predator and Jason Voorhees should prove to make this one of the more unique entries in the series. Ten games in, and the main Mortal Kombat series shows no signs of slowing down. It’s not flawless, but it is a victory.